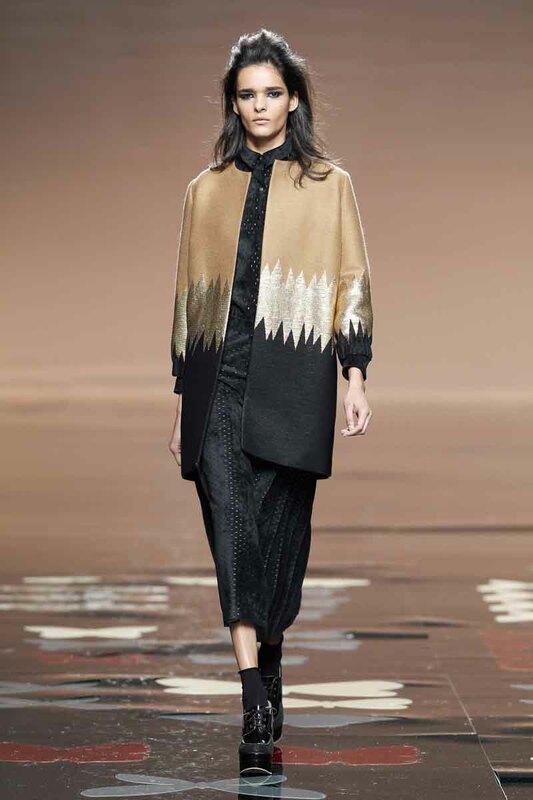 On Saturday, February 15, 2014, at the Feria de Madrid, twin brothers Iñaki and Aitor Muñoz unveiled the Ailanto Fall 2014 collection during Mercedes-Benz Fashion Week Madrid. Ailanto is a fashion design company created by twin brothers Iñaki and Aitor Muñoz, located in Barcelona since 1995. Born in Bilbao in 1968 the designers moved to Barcelona where they graduated in Fine Arts at University College Barcelona. Iñaki complemented his studies with a degree in fashion design. The universe of Ailanto is renowned for its color combinations, geometric forms and references to avant-garde art movements. Signature prints, figurative embroidery and elegant texture juxtapositions are frequently employed to enrich the collections, making the label a visual one, recognizable worldwide. The prêt-à-porter Ailanto collections are sold internationally since 1999, with acclaimed catwalk presentations in the Mercedes Benz Fashion Week Madrid. The year 2010 signals a new era for the brand with the opening of the first Ailanto boutique in Barcelona, shortly followed by the boutique Ailanto in Madrid in 2012. As designers of Ailanto, Iñaki and Aitor have been awarded Best Spanish Designer by Glamour Magazine and the Prix Marie Claire for Best National Designer. In 2005 Ailanto became a member of the prestigious Spanish Fashion Creators Association (ACME). The brand has exhibited its creations at the Victoria and Albert Museum, the Queen Sofia Spanish Institute in New York, the Cervantes Institute in Tokyo, the Spanish embassies in London and New York and the Decorative Arts Museum in Moscow and Cervantes Institute (Tokyo). Ailanto has developed fashion and lifestyle product lines for Sargadelos, Naf, Cerabella, Hazel, DAC and Santa & Cole. The fashion design company has collaborated with Campari, Lladró, TATA Motors, Chupa-Chups, Nespresso, W Hotels and L’Oréal. In 2013 has designed the new uniform for the staff of the Guggenheim Museum (Bilbao).